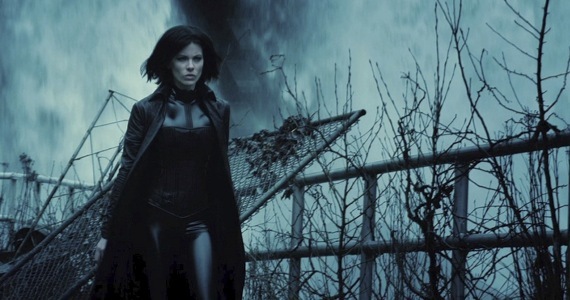 The fourth in the Underworld universe and the third film to star Kate Beckinsale in the lead role of Selene, Underworld: Awakening is an action packed gore fest that holds little substance and sacrifices plot development in favour of slow motion shots containing Beckinsale in skin tight clothing, whilst showcasing an arsenal of weaponry. The film takes place six months after the events in Underworld: Evolution (2006), where vampires and werewolves are being hunted down, following their exposure to the human world. Captured during ‘The Purge’ Selene (Kate Beckinsale) is separated from her lover Michael (Scott Speedman) and is cryogenically frozen for twelve years by a medical company called Antigen. The head doctor Jacob Lane (Stephen Rea) believes that the vampire and Lycan strain is a form of disease and uses Selene as a test subject to find a cure. Following the escape of Subject One (India Eisley), another inmate, Selene herself breaks out and is faced with a world that has hunted her kind to the brink of extinction and has forced the remaining survivors into hiding. Gathering allies in the form of vampire David (Theo James) and human detective Sebastian (Michael Ealy), Selene begins to piece together the whereabouts of Michael, the dark secrets behind the Antigen Corporation and her mysterious psychic connection with Subject One. 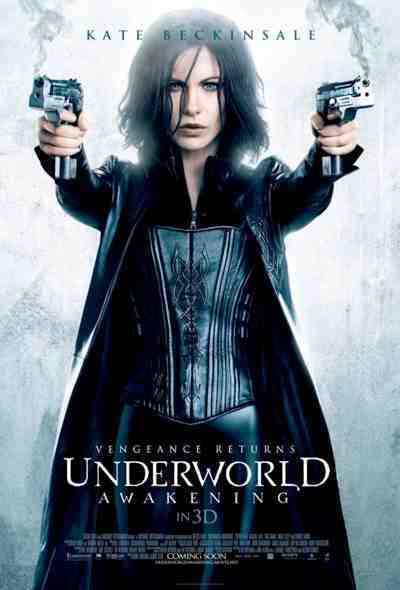 The success of the Underworld franchise has rested firmly in its ability to be so bad its good. Critics have massacred all three of Awakening’s predecessors and yet in terms of box-office takings and fan interest, the entire series has grossed close to four hundred million dollars internationally over the past decade. They must be doing something right if character development, story continuity or even elements of realism are thrown to the sharks, replaced by minutes upon minutes of blood, machine guns and Kate Beckinsale impersonating January Jones’ icy persona (or non-acting) in X-Men: First Class (2011). This is not to say all the films don’t have glimmers of brilliance, with the actual mythology and back-story concerning the war between vampires and werewolves playing a major role in the framing of the plot, as well as connecting the origins of the characters to the contextual events within the films. The lack of vampire/werewolf tension for the first two thirds of Awakening is its greatest failing, with the focus on Selene and her relationship with Subject One taking up time that would have been more suited to Lycan transformations and spirited rebellions. The ‘twist’ in the second half of the film works in theory but its execution leaves one wondering what the hell happened and you spend the remaining minutes trying to grasp the series of events leading to its conclusion. Kate Beckinsale’s Selene is suitably badass, as well as stunning, with Eisley and Ealy providing the emotional edge to play off of Selene’s no mercy mentality. Stephen Rea’s talent is wasted in the cardboard Dr. Jacob Lane, with the motivation behind his malicious intents getting blurred within parallel storylines and making him the stereotypical ‘the end justifies the means’ villain. Surprisingly, it was the human element of Michael Ealy that gave the film a heartbeat amid the snapped necks and broken bodies, allowing for a more balanced perspective of the vampire/Lycan universe, within modern society and how masses would respond to the sudden exposure of supernatural beings. The CGI was superb as usual although like a majority of live action films in 3D the 3D ingredient was entirely unnecessary. When will Hollywood realize that 3D will not make a film better? The continuation of the franchise will have die-hard fans salivating for more but ultimately Underworld: Awakening plays like a special effects infused body count extravaganza with no story or memorable dialogue. Then again like that really matters when it looks Oscar-worthy compared to the horror that is Twilight.